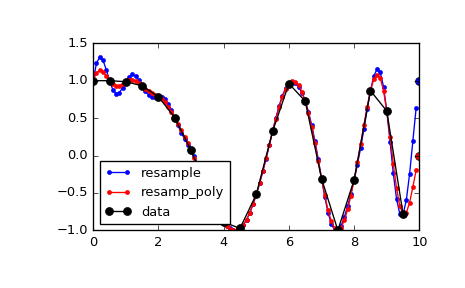 Resample x along the given axis using polyphase filtering. The signal x is upsampled by the factor up, a zero-phase low-pass FIR filter is applied, and then it is downsampled by the factor down. The resulting sample rate is up / down times the original sample rate. Values beyond the boundary of the signal are assumed to be zero during the filtering step. The axis of x that is resampled. Default is 0. Desired window to use to design the low-pass filter, or the FIR filter coefficients to employ. See below for details. Downsample the signal after applying an FIR or IIR filter. Resample up or down using the FFT method. This polyphase method will likely be faster than the Fourier method in scipy.signal.resample when the number of samples is large and prime, or when the number of samples is large and up and down share a large greatest common denominator. The length of the FIR filter used will depend on max(up, down) // gcd(up, down), and the number of operations during polyphase filtering will depend on the filter length and down (see scipy.signal.upfirdn for details). The argument window specifies the FIR low-pass filter design. If window is an array_like it is assumed to be the FIR filter coefficients. Note that the FIR filter is applied after the upsampling step, so it should be designed to operate on a signal at a sampling frequency higher than the original by a factor of up//gcd(up, down). This function’s output will be centered with respect to this array, so it is best to pass a symmetric filter with an odd number of samples if, as is usually the case, a zero-phase filter is desired. For any other type of window, the functions scipy.signal.get_window and scipy.signal.firwin are called to generate the appropriate filter coefficients. The first sample of the returned vector is the same as the first sample of the input vector. The spacing between samples is changed from dx to dx * up / float(down).